Breakfast cereals still contain ‘unacceptable’ amounts of sugar and supermarkets’ own-brand products are the worst offenders, campaigners have warned. The NHS last summer urged manufacturers to change what they put in cereals or face a mandatory sugar tax like the one on soft drinks. But Action on Sugar found nearly half still contain large amounts of sugar, with a way to go for companies to meet Public Health England’s target of cutting sugar content by 20 per cent. The worst offending cereal – Malt-O-Meal’s Marshmallow Mateys – was found to be 40 per cent sugar. The campaign group now say it is ‘immoral’ to have colourful cartoon packaging aimed at children, and are now calling for it to be banned. Many cereals can provide children with a third of their daily sugar allowance in a single bowl before they even leave for school in the morning, the research showed. NHS guidelines recommend children consume no more than 19g of sugar each day between four and six years old, rising to 24g for under-10s and 30g for over-11s. Eating too much sugar can increases children’s risk of becoming obese, developing type 2 diabetes later in life, and suffering from tooth decay. Marshmallow Mateys contain 40.2g of sugar per 100g, which works out at 12.2g in an average bowl, the research found. 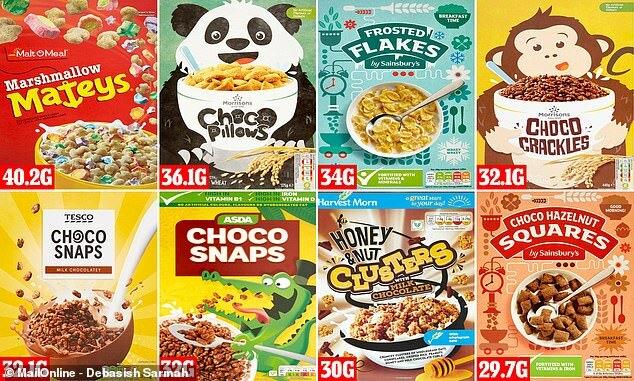 Other cereals containing more than 30g per 100g included Morrisons Choco Pillows (36.1g), Sainsbury’s Frosted Flakes (34g) and Morrisons Choco Crackles (32.1g). Supermarket own-brand cereals dominated the 20 most sugar-filled options, taking 18 of the places. After Marshmallow Mateys – made in the US – the worst offending brand-name cereal is Kellogg’s Coco Pops Rocks in 20th place, with 27g of sugar per 100g. Action on Sugar carried out the research on cereals being sold in the UK alongside Action on Salt, finding many products also contain worrying levels of salt. Only two cereals out of the 77 in the survey – Morrisons Super Smooth Porridge and Sainsbury’s Puffed Wheat – were deemed to have healthy levels of sugar and salt. ‘Breakfast cereals should be a healthy choice as they contain fibre and are fortified with vitamins and minerals,’ said Kawther Hashem, a nutritionist and campaign lead at Action on Sugar. ‘However, our study shows that cereals with packaging that may appeal to children often contain unacceptable amounts of sugar. ‘Why aren’t all cereal manufacturers reducing sugar levels as per Public Health England’s evidence-based recommendations and actively marketing healthier (those with green traffic lights for fat, salt and sugar) breakfast cereals to parents and children? The campaign group split the cereals into red (more than 22.5g of sugar per 100g cereal), amber (5g to 22.5g sugar) and green (less than 5g sugar). Almost half of all the cereals – 38 out of 77 – were rated red for sugar, while 37 were amber. Last year, chief executive of NHS England Simon Stevens warned sugary breakfast cereals should be treated in the same way as fizzy drinks to fight childhood obesity. Mr Stevens said food manufacturers will have to change the way they produce breakfast cereals if the Government’s obesity strategy is to succeed. Giving evidence to the Commons Health and Social Care Committee, he said it was concerning that products marketed as healthy often contained large amounts of sugar. ‘On average children are having the equivalent of three sugar lumps at breakfast,’ he said at the time. Packaging often featuring animals and bright colours add to cereals’ appeal to children, experts fear, and critics say companies should be stopped from using them. Professor Graham MacGregor, chairman of both Action on Sugar and Action on Salt, said: ‘This survey shows that companies that make packaging of unhealthy products targeted at children are completely irresponsible. ‘It is immoral that breakfast cereals companies can get away with it, it is time we made it easier for parents and only allow those cereals which carry a green label to be allowed to feature cartoons on packaging which may appeal to children. Salt is also a problem, campaigners said, with 65 of the cereals in today’s research receiving an amber warning, meaning they contained more than 1.6g per 100g of cereal. NHS guidelines recommend children consume no more than 2g of salt each day as toddlers, 3g daily between the ages of four and six, 5g between seven and 10, and 6g per day for over-11s. For salt, Marshmallow Mateys was again the worst offender and the only cereal to receive a red rating for its 1.6g – more than is in a bag of ready salted crisps. Director of Action on Salt, Katharine Jenner, said: ‘As a parent, it is frustratingly hard to try and find food and drink products that are both nutritionally balanced and appeal to your children.